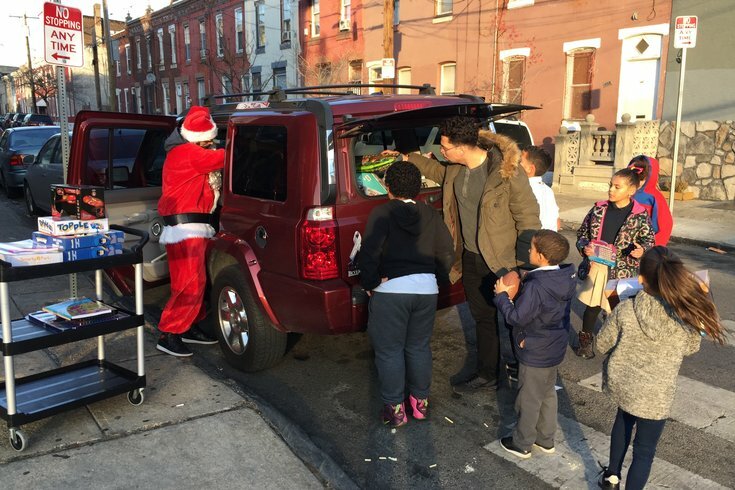 Children flocked to Ricardo Rivera's SUV in West Kensington on Wednesday, December 20, 2017 since it was full of gifts from the Tuffy's Fight toy drive. Ricardo Rivera grew up right across the street from The Lighthouse PAL Center in Kensington. It was the type of place that kept him out of trouble in his preteen years, he said. With those ties to the Somerset Avenue facility, it made perfect sense why he returned to share presents he received at a weekend holiday-party toy drive with several dozen children at the afterschool program there on Wednesday afternoon. Upwards of 80 people attended Saturday night’s toy drive which, held at Philadelphia Visionary Arts Gallery, was organized by Tuffy’s Fight. That group is inspired by Rivera’s daughter, Tatyana (nickname: Tuffy), who suffers from an extreme form of epilepsy called Lennox-Gastaut Syndrome. Rivera, who has seen that cannabis oil helps reduce the number of seizures that Tuffy suffers, advocates for medical marijuana. So generous were attendees at the second-annual event that Rivera’s SUV was packed from floor to roof with toys. An Eagles football, an Operation board game and jewel-making kit were among the first toys selected. On Wednesday, he handed a bunch out to children in need in Camden. On Thursday, he and fellow marijuana-activist Richard Tamaccio (aka N.A. Poe) cruised up to Kensington to share the rest of the toys. Before they even got inside the building, neighborhood kids flocked to the vehicle, each getting an early Christmas gift. Word spread quickly, leaving the duo – Tamaccio dressed as Santa Claus – outside for a good 15 minutes. Still, there were more than enough presents left for the 40 kids – from kindergarten to eighth grade – who were at the after-school program this day (and their siblings). They attend schools including Julia De Burgos, Isaac A. Sheppard and Potter-Thomas Elementary, Community Academy and Pan American Academy charters, and Conway Middle. Even some of the teachers were able to load up on books and arts-and-crafts supplies that they can use at Lighthouse. 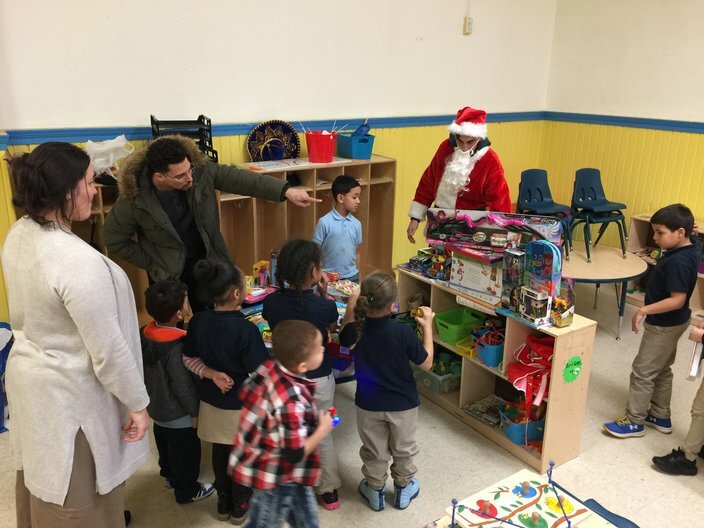 Ricardo Rivera (second from left) and Richard Tamaccio (in Santa suit) delivered presents from a weekend toy drive to children at the Lighthouse PAL Center in West Kensington on Wednesday, December 20, 2017. John Lavery is executive director at the Lighthouse, where the need to reach out to potential donors is probably the most time-consuming part of the job. That Rivera and Tamaccio showed up unannounced was kismet. It was particularly well-timed and helpful since Lavery said children from families who fled hurricane-damaged Puerto Rico rely on them for support. “We have greater needs this year in that respect,” he said. “We’re trying to help them provide the type of holiday they want for their kids. Today, they had something, and they couldn't have been happier. 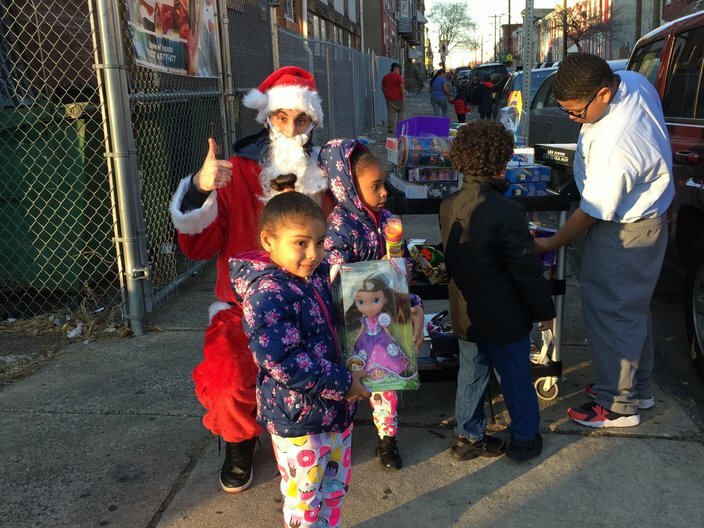 Santa and the kids outside the Lighthouse PAL Center in West Kensington, December 20, 2017.